Excellence and Elegance comes as a package, when it's an Apple product. Here is the Apple iMac MK142HN, that dons a screen size of 21.5 inches. The iMac you see here, is capable of operating all your editing and graphical requirements. Be it high-definition video editing or graphic designing, iMac delivers the result, that you won't ask for more. Check out the Apple iMac MK142HN, and see the state-of-the-art features it comes housed with. Genius display of Apple iMac MK142HN, comes with the support of multiple facets of excellence. The display of 21.5 inches, that it comes with, is backed with LED-backlit display. The screen presence of the monitor, gets boosted with the IPS technology it comes housed with. The monitor is also backed with Intel HD Graphics 6000, to add life to the images displayed on the screen. Rest assured with the arming system of Apple products, it comes with. Speaking on the processor front of iMac MK142HN, you have the 1.6 GHz of powerful dual-core Intel Core i5 Processor. Alongside, you also have the Turbo Boost up to 2.7 GHz, to enhance your experience. And ofcourse, the monitor supports it's personalised Apple's operating system. Great experience has to be loaded with great space for memory. The iMac MK142HN has a wide space of storage. The monitor comes with 8 GB of 1867 LPDDR3 onboard memory, which strengthens your multitasking ability. The space is configurable up to 16 GB. Coming on the Hard drive feature of the monitor, it has a 1 TB of hard drive with 5400 RPM. The space is configurable up to 1 TB of fusion drive or 256 GB of flash storage. All faces of multimedia, gets a powerful and friendly platform with iMac MK142HN. The set dons a FaceTime HD camera; which is capable of simultaneously supporting full native resolution on the built-in display, and also supports 3840x2160 pixels of external display. It also supports extended desktop and video mirroring modes. Other features of multimedia platforms gets enhanced with the stereo speakers, dual microphones, 3.5mm headphone jack, headphone/optical digital audio output. The set also supports Apple iPhone headset with microphone. High end connectivity is the perk of using iMac MK142HN. The monitor comes with SDXC card slot and four USB 3 ports (which are also compatible with USB 2. Apart from this, the monitor comes with connectivity slots like two thunderbolt 2 ports & mini display port. The monitor set also supports HDMI, DVI, VGA and dual link DVI (for which adapters are sold separately). Get connected with internet, with the help of 10/100/1000 BASE T Gigabit Ethernet (with a RJ-45 connector). Feel the magic of connection with the magic keyboard, magic mouse and magic trackpad. You can easily connect with the world of internet with the easily connectivity of WiFi. Excellence and Elegance comes as a package, when it's an Apple product. Here is the Apple iMac MK142HN, that dons a screen size of 21.5 inches. The iMac you see here, is capable of operating all your editing and graphical requirements. Be it high-definition video editing or graphic designing, iMac delivers the result, that you won't ask for more. 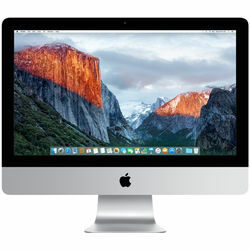 Check out the Apple iMac MK142HN, and see the state-of-the-art features it comes housed with.Design & DisplayGenius display of Apple iMac MK142HN, comes with the support of multiple facets of excellence. The display of 21.5 inches, that it comes with, is backed with LED-backlit display. The screen presence of the monitor, gets boosted with the IPS technology it comes housed with. The monitor is also backed with Intel HD Graphics 6000, to add life to the images displayed on the screen.Processor & OSRest assured with the arming system of Apple products, it comes with. Speaking on the processor front of iMac MK142HN, you have the 1.6 GHz of powerful dual-core Intel Core i5 Processor. Alongside, you also have the Turbo Boost up to 2.7 GHz, to enhance your experience. And ofcourse, the monitor supports it's personalised Apple's operating system.Memory & StorageGreat experience has to be loaded with great space for memory. The iMac MK142HN has a wide space of storage. The monitor comes with 8 GB of 1867 LPDDR3 onboard memory, which strengthens your multitasking ability. The space is configurable up to 16 GB. Coming on the Hard drive feature of the monitor, it has a 1 TB of hard drive with 5400 RPM. The space is configurable up to 1 TB of fusion drive or 256 GB of flash storage.MultimediaAll faces of multimedia, gets a powerful and friendly platform with iMac MK142HN. The set dons a FaceTime HD camera; which is capable of simultaneously supporting full native resolution on the built-in display, and also supports 3840x2160 pixels of external display. It also supports extended desktop and video mirroring modes. Other features of multimedia platforms gets enhanced with the stereo speakers, dual microphones, 3.5mm headphone jack, headphone/optical digital audio output. The set also supports Apple iPhone headset with microphone.ConnectivityHigh end connectivity is the perk of using iMac MK142HN. The monitor comes with SDXC card slot and four USB 3 ports (which are also compatible with USB 2. Apart from this, the monitor comes with connectivity slots like two thunderbolt 2 ports & mini display port. The monitor set also supports HDMI, DVI, VGA and dual link DVI (for which adapters are sold separately). Get connected with internet, with the help of 10/100/1000 BASE T Gigabit Ethernet (with a RJ-45 connector). Feel the magic of connection with the magic keyboard, magic mouse and magic trackpad. You can easily connect with the world of internet with the easily connectivity of WiFi.